Special scholarships are offered to students who have demonstrated exceptional talents and/or leadership in their high school or community. Due to the competitive nature of these scholarships, you will have to interview or audition, and submit additional application materials. Once awarded, these scholarships are offered for four years, as long as you maintain academic eligibility, in addition to the specific conditions of the scholarship. 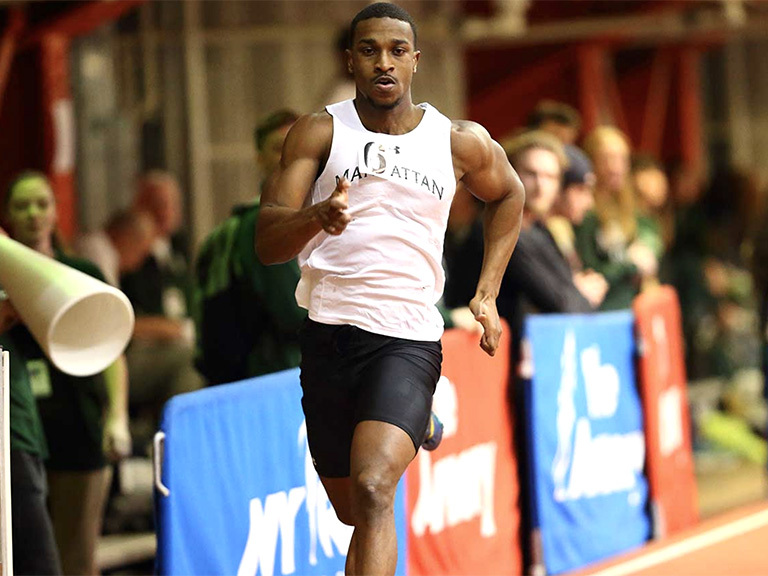 For students recruited to participate on one of Manhattan College’s Division I athletic teams, there is the possibility of an athletic scholarship. These students must be deemed admissible by our traditional academic standards. Athletic scholarships and their amounts are determined exclusively by the Athletic Department. These scholarships are renewable, subject to a student remaining academically eligible, and in accordance with specific conditions determined by the Athletic Department. The Performing Arts Scholarship is available to talented students who have been accepted into the freshman class and demonstrate exceptional ability in the area of instrumental or vocal music. Auditions are required to be considered for a Performing Arts Scholarship. To learn more about the ways you can get involved with performing arts at Manhattan College, see our list of ensembles. You must be able to read music and have experience in choir, orchestral, band or chamber music settings. You must perform a video audition and send to a panel of performing arts faculty. You must submit the application form below. Scholarship awards are contingent upon you enrolling in a minimum of two performing arts ensembles. Awards are dispensed each semester, and are renewable upon satisfactory evaluation by the ensemble director and the coordinator for performing arts. Criteria such as punctuality, attendance, leadership skills and progressive musical development, as well as remaining in good academic standing are critical to successful evaluation. The award is $2,000 per year and will renew annually each year (for a maximum of four years), so long as the student maintains satisfactory participation in the College ensembles. You must prepare two musical selections of contrasting styles and/or periods. Instrumental students will be required to play a two-octave major and minor scale chosen by the panel. Vocalists should be prepared to sing one of the musical selections in a language other than English. Both vocalists and instrumentalists will be given a short selection to sight-read. Auditions will be held during Orientation for deposited students on 6/6, 6/13 and 6/20. For more information, please contact Andrew Bauer, director of performing arts, at andrew.bauer@manhattan.edu or 718-862-7254. Named after Saint John Baptist de La Salle, founder of the Brothers of the Christian Schools, this scholarship is awarded to a select number of accepted students from Lasallian high schools who have demonstrated significant leadership and excelled in the area of service, both in their high school and community, and wish to continue in that spirit of service at Manhattan College. Recipients of this award are expected to become leaders on campus who actively participate in service projects through Manhattan College's various Lasallian groups and organizations. Students who are interested in applying for this award must be accepted into Manhattan College as freshmen by January 15. Applicants will be awarded by the Office of Admissions to students that attend a LaSallian High School. Recipients will be required to give service at the College by the Office of Mission. Communication Department (e-mail address: thom.gencarelli@manhattan.edu). Also, please make sure you include your complete contact information, including a phone number and e-mail address, so that we can contact you if you are a finalist. The scholarship committee will review all applications and schedule an interview with the finalists during Orientation for deposited students on the following days 6/6, 6/13, and 6/20 after 6pm. The scholarship recipients will then be notifed of the decision once the review is completed.